There was a post awhile back about powder Coated rims are better than painted rims, I agree I got a sample from my powder coater. The powder coating is sold by Cardinal Industrial Finishes. I use the ETI Beige Semi Gloss. I am turning all my T's rims to this color. I even keep some rims already powder coated with this finish and use them each time I change a tire. t I have a hard time telling which is which. I am sure that your powder coater can get this finish or one close to it. The phone number of one of the outlets is Colorado 303-286-1876. The powder coating is very resistant to nicks from a tire iron. I know that anyone that sees one of my rims will think that it is the original Zinc. Thats a good idea Dave. I've been doing it for years. Whenever I have to change a tire that aluminum or silver painted rim gets set aside until I get 4 or 5 to take to the powder coater. . . Rims will also be impervious to male dog pee. I also reuse cotter pins but DON'T use Phillips head screws. Why not get them zinc plated as original? Like paint, powder coating is only as good as the prep, so it is not guaranteed that it will not chip or flake. 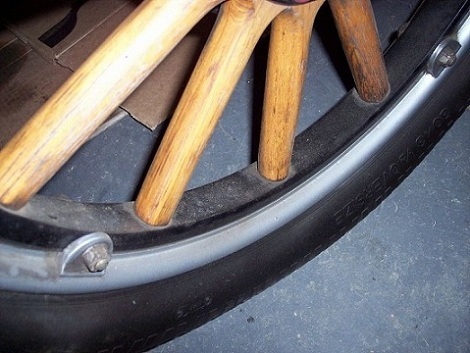 Also, a long time ago, I used to race Karts and some folks powder-coated the chassis, but I was advised this was not a good idea as it hid cracks in welds better than paint, so for the same reason it may not be suitable for '26 -'27 wire wheels. Number one I have never heard of doing that and what would be the advantage of Zinc ? Number two We don't all live in Southern California, thank god. where there are so many people that a shop could afford to do Zinc. Most of us live where there is a powder coater, but Zinc? There is a lot of guys who are powder coating their rims and I put out this information as one possible powder coat to use. If powder coating on rims is going to bother you don't look. Due to EPA and disposal rules, almost any kind of plating is getting expensive and like Dave said, it is getting hard to find shops that will plate any kind of metal plating for any price in some localities. If everyone who reads this forum and finds a good quality plating shop, doing work for a bargain, or at least a reasonable price, will post their findings here, it would serve as a data base that others could benefit from. As for powder coating, if you are worried about powder coating hiding cracks or flaws, then maybe having your wheels/rims checked with magniflux before coating would lessen your concern. I use powder coating on my 26-27 wire wheels, but don't know what is on my 26-27 demountables, as they were done when I purchased the car. Since neither car will ever be judged, I am not that much into correctness. If your going for judging quality, and you have the money to do everything 100% Ford correct, and either have a local plater or don't mind sending your parts, miles away to be plated, 'knock your lights out' and 'go for it'. The old timer I got my last T from did the rims with grey paint with a touch of silver paint mixed in. I thought they were zinked when I first saw them. he just laughed. I used t have a few Ts with White walls. I found when I used a white wall cleaner it took a lot of the paint off. That is another reason for powder coating. BUT I am not trying to talk anyone else into doing powder coating. I am only trying to point out the type of powder coat that my powder coater uses that I really like. Its your T do as you want and enjoy it. Those white wall cleaners (especially Westley's Bleach White) can be pretty strong stuff. Instead of spraying them directly on the tire, I spray them onto a clean rag and wipe down the whitewall to keep the cleaner away from anything else. Then, I wipe the tires with a clean, water soaked cloth to remove the whitewall cleaner, then buff dry with another cloth. It uses up a lot of cloths, but it keeps the cleaner away from the paint. Next year come and enjoy the mountains with some of our locals. It won't make any difference how you finish your rims. None of us will criticize what ever you do with your rims. We just enjoy doing the mountains and hope you do also. Carl, I don't know what type of Powder coat you have but all the ones I've used can be buffed and polished easily. PC is paint, use a good quality buffing compound or polish and it can be returned to full gloss. The best ones are those used to restore the modern 2 part enamels used to repair cars today. 3M make a great product for this. When powder coating a windscreen frame I actually had to use a fine file to shave some of the thickness of PC off it to get it to fit the window opening, I then fine sanded and polished the gloss back. Another thing not mentioned so far is that PC enables you to get coverage on the entire BE rim. Its nearly impossible to spray up under the bead with normal paint, PC will coat his area if you put PC near it. Peter, I don't have a lot of experience with PC, but this is the advice given me by a reputable PC outfit. On my nonT car I have PC welded wire wheels that I have scuffed a bit. I will try buffing and report back. I now am hoping for the best! I think the original rims were cadmium plated. I don't know of anyone who uses cadmium anymore. However, a good aluminum paint or powder coating look very much like original. Your wheels and Dave's wheels look very good in the pictures. Dave, I had my rims galvanized at the Valmont plant near Tulsa. I figured the original type of plating was worth the drive to Tulsa. They have locations all over the country. Their facilities closest to you are near Salt Lake City and at Salina, Kansas. 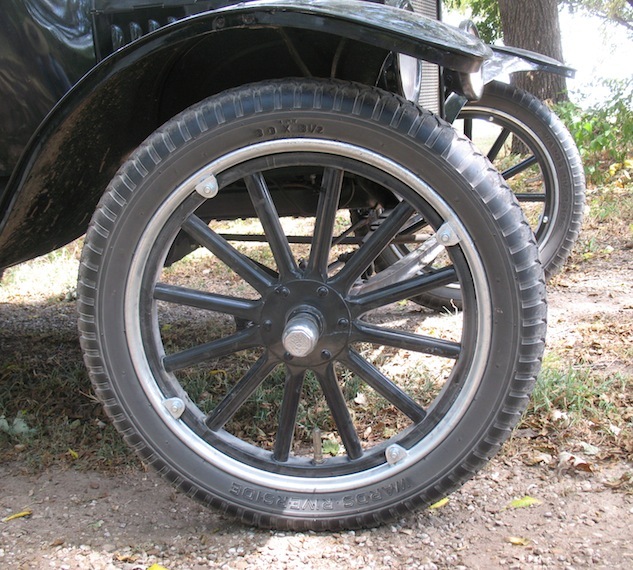 Were all Model T Rims Zink or Cadnium? I guess that explains allot of the silver rims I have been seeing in Pictures. What's the history on the silver rims? When did Ford start doing that? Also what other parts are supposed to be Zink or Nickel on a Model T? 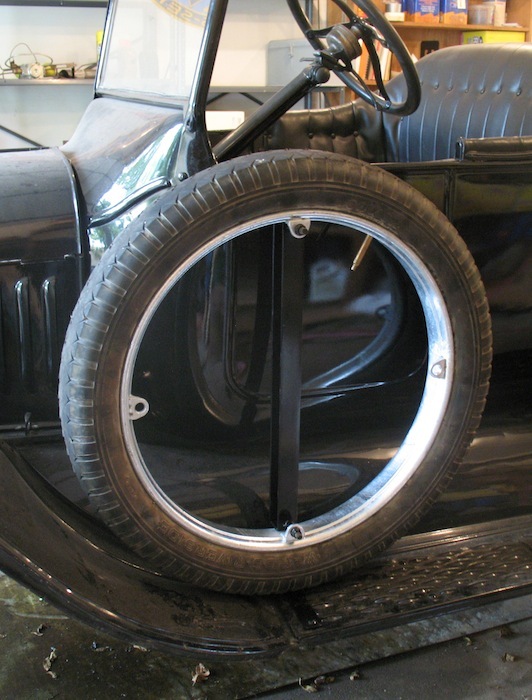 No, the original rims were not cadmium plated. They were zinc plated (galvanized). I've posted this information about galvanizing on the forum several times. I guess I need to put it on my website so I can just post a link whenever the question comes up. As most of you know, I like to keep stuff as close to original as I can. Yes, powder coating probably looks ok, until you have to change a tire, and then what happens to it? I'll go along with Steve Jelf, but would still rather do zinc as opposed to galvanizing. 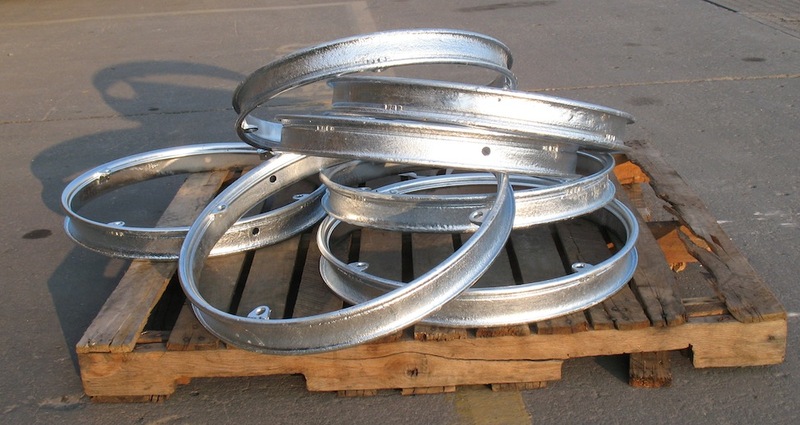 A word of caution, if you are going to do plating, get all the rims you intend to plate done at the same time, as there are many variations on zinc as far as the color goes. "the urgency of his voice galvanized them into action"
"the reverend's words galvanized our group into action"
early 19th cent. (in the sense �stimulate by electricity�): from French galvaniser (see Galvani, Luigi). Yes, galvanizing IS zinc plating. It's done in two ways. One is electroplating. The other is the hot dip method. As the name implies, an object is dipped in hot zinc to coat it. That's how my galvanized (zinc-plated) rims were done. 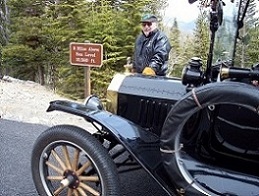 What other parts of a Model T were Zink or Nickel? I can think of the Steering Gear Case and the Carb and Advancer levers, any other parts? 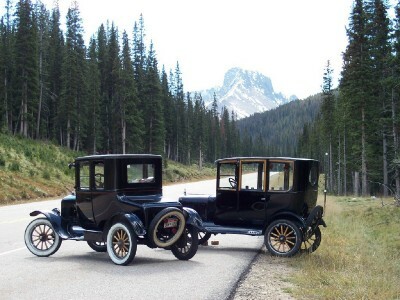 I would like to keep my 1922 Touring as close as possible to original.